Feminine beauty meets vibrant radiance in this pendant necklace by Babun Dey of India. 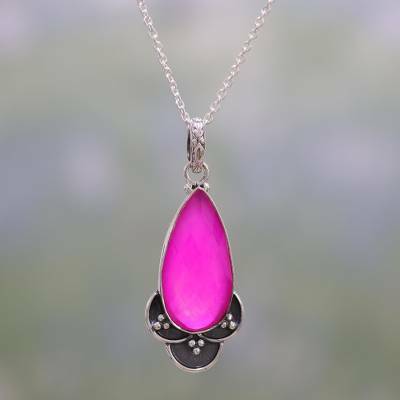 Handcrafted sterling silver accents highlight the bright pink hue of dyed chalcedony. The stunning checkerboard-cut gem weighs over ten carats. Purchased the necklace and the earrings. They are beautiful. The color it?s a beautiful pink. I was worried the size of the pendant and earrings might be too small but they are not, very noticeable. I will enjoy wearing this set for long time I will purchase more items from this artist.